After 1964’s “Beatles For Sale” had seen The Beatles move from rock n roll covers and lyrically twee pop songs to a more cynical, worldly-wise (particularly in the case of John Lennon’s lyrics) approach to songwriting, this 1965 was very much the transitional album in their career. The one that saw them complete the move from lovable teen pop group to a “serious” band. Bob Dylan was already 100% more serious and credible, so they had some work to do. 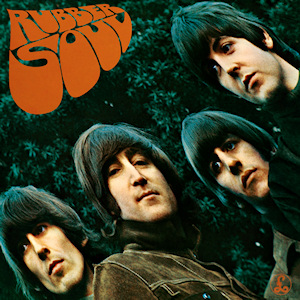 “Rubber Soul” was said to be a “folk rock” album. I am not sure about that. Yes, there was the acoustic “Norwegian Wood”, but that’s really as far as it went, in my opinion. It is still very recognisably The Beatles. They still ploughed their own unique furrow although they were “borrowing” from other artists quite considerably on here. Firstly, the sound is fantastic in this album. Forget all that “mono sounds best” stuff. Just listen to the stereo (use “Norwegian Wood” as an example) - it will blow you away. The "Dylan influence" is supposed to be present here. I have never really bought that, to be honest. It is just a great song in its own right, and sounds like pure Lennon to me, not anyone else. Back to the mono/stereo thing, the album is an enjoyable listen in mono, but the stereo remastering really adds something special to it, in my opinion. The album still has an upbeat poppy appeal, however, but the “pop” is well-crafted mature pop, such as the jangly but melodic Byrds-influenced “Nowhere Man”, the slightly lyrically sombre but nevertheless singalong “You Won’t See Me”, with its wonderful harmony vocals and the country-ish Ringo Starr co-credited “What Goes On”. The rocking, cowbell, piano and guitar riffing of the opener, “Drive My Car” is incredibly catchy, and underneath its pop facade has some great guitar parts. On all these tracks. McCartney's bass sounds wonderful, particularly on "Nowhere Man" - warm, melodious and throbbing nice and loud, just as I like it. 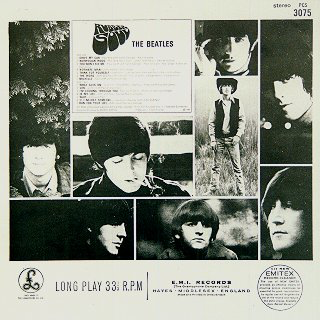 Just as on 1964's transitional "Beatles For Sale", however, miserable old Lennon and his love life problems are never far away by now, in introspective retrospections such as the plaintive “Girl”, with its slightly off-putting hissing vocal part; the confessional and majestic “In My Life” and the slightly unnerving “Run For Your Life”. The lyrics to the latter can even sound a little creepy at times. However, Lennon baring his cynical soul is essential to The Beatles' development into something highly credible after the pure pop of the early material. "In My Life" has a reasonable case for being his finest song to date. "Think For Yourself", with its excellent Harrison vocal and slightly distorted but thrilling guitar solo is a revelation. great track. Lennon is back on the rhythmic, bass-driven rocker that is "The Word". McCartney's bass is rumbling and almost funky and there is another distorted guitar part. Instrumental experimentations such as this were starting to appear too, such as Lennon’s use of a baroque harpsichord on the bridge in “In My Life”. The Rolling Stones, of course, had been using such instrumentation for a while by now, it is wise to remember. A definite change in the band’s output an approach was taking place, but do not ever discount the other musical influences that helped to create this transitional work - The Byrds, Bob Dylan, The Rolling Stones, even The Who. McCartney's "Michelle" was basically a solo song on his part, typically tuneful and catchy with again a lovely bass line near the end. Granted, it is a bit throwaway, but it is an enjoyable diversion. Starr's love of mid-pace "country rock" is reflected in his collaboration with Lennon and McCartney and vocal on the appealing, but lightweight "What Goes On". The steady drum sound on this is beautiful, though, as are the guitar interjections. The sound on this one is amongst some of the best sound reproduction on the album. McCartney's rousing "I'm Looking Through You" has many country-ish airs too, but there is also a killer high-pitched guitar interjection and a throaty, rasping vocal that almost apes Lennon at times. Lennon's "Wait" sounds like a bit of a throwback to a few months before, as if it should have appeared on "Help!". Most supposed Lennon/McCartney compositions by now were no longer the half-and-half collaborations they were in the early to mid sixties. By "Beatles For Sale" they were clearly either "Lennon songs" or "McCartney" songs. This one, though, has signs of being back to the old double-act thing. Maybe that is why, on this album, it sounds just a little dated and out of place. Harrison's "If I Needed Someone" is his second impressive song on the album but for whatever reason they always seem to be overshadowed by the catchy instant appeal of McCartney's songs or the lyrical "in your face" attack of Lennon. This is perfectly exemplified by the next track up, the closing, afore-mentioned "Run For Your Life" from Lennon. Bit of a shame for Harrison, but it was just the way it was. Listening to "Rubber Soul" always give repeated pleasure. I have to say that in many respects this is my favourite Beatles album.